Enter the BootDaddy.com PFI Western Kawasaki Giveaway Contest now through September 9th, 2018 for your chance to win Kawasaki 4×4 Special Edition SE Mule (valued at $9,500). How To Enter The Giveaway At BootDaddy.com? Visit this link:BootDaddy.com Giveaway to go to the giveaway page. Once you have filled out the entry form now Click on the “Enter” button in order to enter this giveaway. Prizes You Could Win: The winner will be awarded a Kawasaki Mule (valued at $9,500). The winner will be responsible for sales tax, registration and transportation fees on the Kawasaki Mule and is responsible for providing transportation or pickup of the prize. Who Can Enter: This contest is open only to legal residents of the (48) United States District of Columbia who are eighteen (18) years of age or older at the time they enter the sweepstakes. If you live in outside of the US then you will responsible of shipment at your expense. 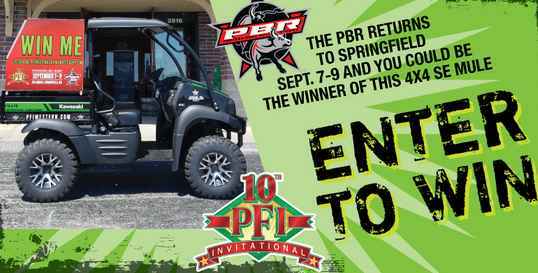 When To Enter: The PFI Western Kawasaki Giveaway Contest begins on June 7th, 2018 and ends September 9th, 2018. Sponsor: PFI Western Store Home of BootDaddy2816 S. Ingram Mill Rd. Springfield MO 65804.